Online travel and transport websites provide the ease with which any consumer can compare prices, research their chosen destination, and chose the best way to get there, all with the click of a mouse button. The traveling industry is growing at a fast pace. 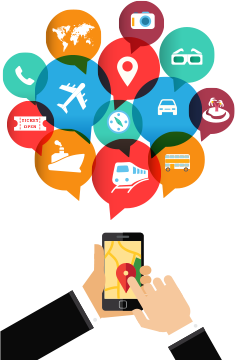 Traveling supports tourism activity across the country, which in turn, helps build the economy: W3care helps companies in the Tours, Travel and Hospitality industries leverage technology expansively, and economically address their most imperative business needs. We have the global reach, the skilled people and the industry knowledge to solve your business problems. So, if you want to start an online travel business, then you have landed at the right place. We are experts at designing, developing & customizing travel & tourism websites for our global clients. The travel websites allow your customers to book holiday destinations, hotels, travel tickets and much more. Keeping the same in mind we develop have intuitive interface and unique features. As per your specifications, we also integrate highly secured payment gateways with such websites. Do you run tours and travel business and does not have a website? Contact us today and share your requirements with our team, and we will get back to you with the best solution. Please visit our portfolio and explore our best work. W3care Technologies works as whole team of developers, designers, quality analysts and search engine optimization executives. Our sole purpose is to deliver project with client satisfaction. We work with advance technology to do development of client project with innovative ideas. We are always passionate and dedicated to learn new things with great achievements. Our teams follow agile methodology to provide best in development. W3care is flexible and up for any challenging tasks. Satya is always around to answer your questions and to address your concerns. Their development team are well versed and highly experienced. They work fast and they are very adaptable to change. We can't thank them enough.